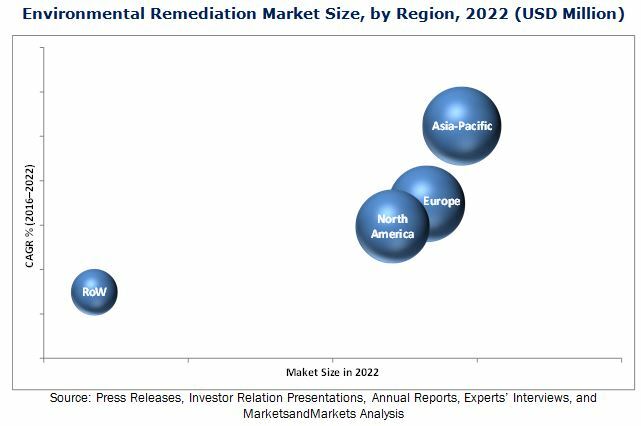 The environmental remediation market is expected to reach USD 123.13 Billion by 2022, at a CAGR of 7.62% between 2016 and 2022. The base year used for this study is 2015 and the forecast period is considered for the period between 2016 and 2022. The oil and gas and mining and forestry applications are becoming popular because of the high demand for remediation services for removing contaminants from soil and groundwater. Environmental remediation is an environment service technology which focuses on the definitive goal of providing large-scale remediation technology at a low cost for environmental protection and pollution control. This report provides a detailed analysis of the environmental remediation market based on environmental medium, technology, application, and geography for four main regions North America, Europe, Asia-Pacific (APAC), and Rest of the World (RoW). The report provides detailed information regarding the major factors influencing the growth of the market (drivers, restraints, opportunities, and challenges). The main driver for market is the growing number of government initiatives for environment pollution control. This is boosting environmental remediation technology in various applications such as oil and gas and construction and land development. The report also profiles the key players and comprehensively analyzes their market ranking and core competencies, along with detailing the competitive landscape for market leaders. To estimate the size of the environmental remediation market, top-down and bottom-up approaches have been used. This research study involves the extensive usage of secondary sources, directories, and databases such as Factiva and OneSource to identify and collect information useful to study the technical, market-oriented, and commercial aspects of environmental remediation. The research methodology is explained below. This entire research methodology includes the study of annual and financial reports of top players, presentations, press releases, journals, paid databases, and interviews with industry experts. 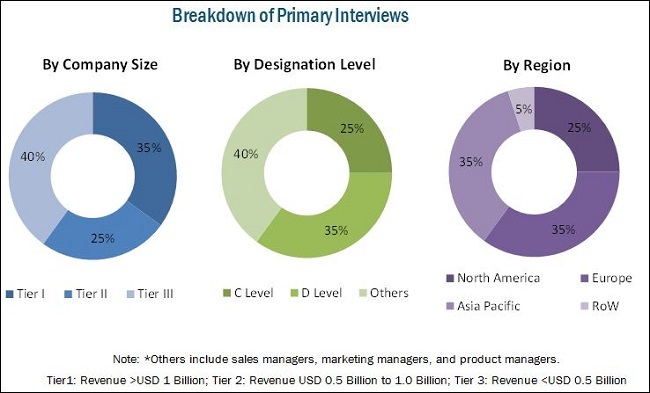 Competitive developments such as contracts, agreements and acquisitions, new product developments, and research and development in the global market have been analyzed. All the percentage splits and the breakdown of the market segments are analyzed on the basis of secondary and primary research. The figure below shows the breakdown of the primaries on the basis of company type, designation, and region conducted during the research study. This report provides valuable insights regarding the ecosystem of this market such as government agencies (Environmental Protection Agency (U.S.)), technology providers, OEMs (Telluric Land Remediation Ltd. (U.K.), Sequoia Environmental Remediation Inc. (Canada), Mid-Atlantic Environmental Equipment, Inc. (U.S.), and BAUER Resources GmbH (Germany)), contractors and distributors (Golder Associates (U.S.)), environmental remediation equipment manufacturers (Sandvik AB (Germany), application developers (GEO, Inc. (U.S.)), chemical solution providers (Oxidation Systems, Inc. (U.S.) and ORIN Remediation Technologies, Inc. (U.S.)), and standardization and testing firms (Environmental Remedial Testing, Inc. (U.S.)). This study answers several questions of stakeholders, primarily which market segments to focus on in the next two to five years for prioritizing efforts and investments. This research report categorizes the global environmental remediation market based on environmental medium, technology, application, and geography. The environmental remediation market is expected to be worth USD 123.13 Billion by 2022, at a CAGR of 7.62% between 2016 and 2022. It is widely used in the oil and gas and mining and forestry applications. Environmental remediation is one of the environmental services perceived as a long-term strategic solution for environmental pollution control by removing the contamination from soil and groundwater. In 2015, the oil and gas application accounted for the largest share of the environmental remediation market, followed by the mining and refinery applications. The market for the oil and gas application is expected to grow at a high rate during the forecast period. Environmental remediation technologies are used to clean wastewater, gas emissions, solid waste, and aerosols generated during production or refining, and spillage of oil or petroleum products during transportation. In the mining and forestry application, there is a growing demand for environmental remediation technology to remove the contamination from soil, groundwater, and surface water caused by chemicals produced from mining processes. This is likely to boost the demand for the environmental remediation technology in these applications. The players in the construction and land development industry focus on the environmental assessment and remediation services for ecological solutions for their land development requirements, thus driving the demand for the environmental remediation technology in this application. Soil vapor extraction and pump and treat technologies are expected to experience high growth during the forecast period. In the remediation technology, the soil vapor extraction method for soil and pump and treat for groundwater is used for removing volatile organic compounds and toxins. Also, bioremediation technology is used to remove contaminants from soil and groundwater by using natural plants. Thus, the demand for these technologies is expected to drive the market in the future. APAC is expected to hold the largest share of the environmental remediation market in 2022; the market in the region is expected to grow at the highest CAGR between 2016 and 2022. The growing population, industrialization, high consumption of oil and gas, and government regulations for environment protection are the major factors driving the market in the APAC region. One of the key restraining factors in the environmental remediation market is the slow implementation of environmental protection regulations due to the lack of awareness of various environmental technologies and lack of training for resolving environmental concerns in developing countries. Clean Harbors Inc. (U.S.) is one of the leading providers of environment, energy, and industrial services such as aggregate, hazardous waste incinerators, landfills, and treatment facilities in North America. The company also focuses on oil and gas cleaning services so that the refined oil can be resold to customers for generating revenue. The major strategy adopted by this company is acquiring other environmental remediation players to expand its business and lead the environmental remediation market. 12.8 Environmental Remediation Resources Pty Ltd.